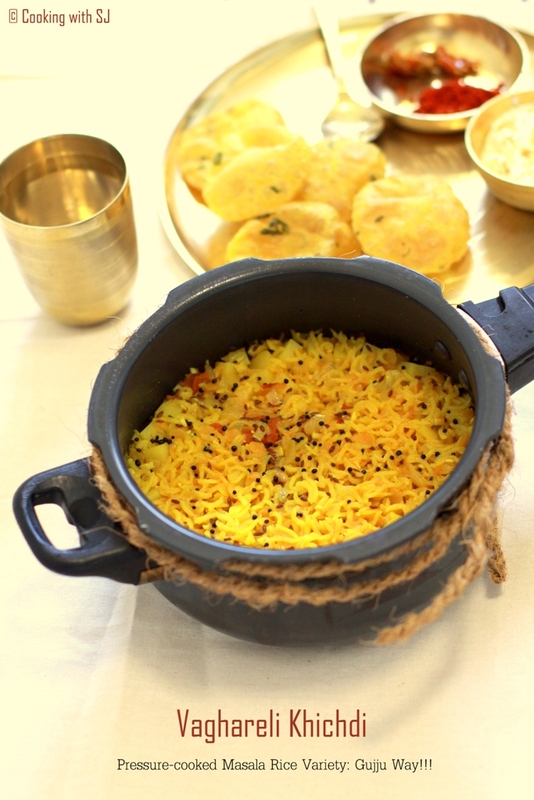 When I was a kid, I always felt ‘Khichdi’ was a typical Gujju food! Never knew that many states of India have their own version of it :) Have never tried those varieties yet, but would love to make them one-by-one soon :) Till then, I simply love it the way I have learnt since childhood!!! Wash and soak rice + toor dal in plenty of water for 1-2 hours. Heat ghee in a pressure-cooker and add mustard seeds in it. Once it splutters well, add cumin seeds and hing. Let it crackle well. Add ginger paste, minced garlic and chopped onions in it and saute everything for a while. Mix in chopped veggies (cut into pieces) and give a quick toss. Add soaked rice & tuver dal along with 1.5 to 2 cups of water and spices. Pressure-cook for 4 whistles and serve hot with a bowl of yogurt! Adjust the whistles according to your pressure-cooker! You too have a diff version of khichdi, dont u??? Looks so yummy! Love the color!